Julius Röntgen (1855-1932) was both a composer and a gifted pianist, and as such he knew how to write well for his instrument. Röntgen was a child prodigy and from an early age composed ambitious works for the piano. He frequently performed his own, and others', piano concertos. Beethoven's Fourth and Brahms's Second were particular favourites. It was through performances of Beethoven's Piano Sonata op.111 and Schumann's Etudes Symphoniques that Röntgen established himself. However, it was not as a soloist but as an accompanist that Röntgen would make a lasting impression. The partnership with his contemporary, the baritone Johannes Messchaert, was legendary and they made several European tours. At one of their recitals, in the Vienna Musikvereinsaal, it was noted that Brahms and Grieg were sat together in the front row. Röntgen composed constantly throughout his performing and teaching career. Opus numbers were only applied to printed works, itself a fraction of his more than 600 compositions. Recent renewed interest in Röntgen has revealed many treasures still waiting to be awakened in the Röntgen Archives (Den Haag). Alongside a huge series of unknown string quartets, string trios, piano trios and symphonies there are some thirty piano sonatas and sonatinas from 1922-1932 alone. 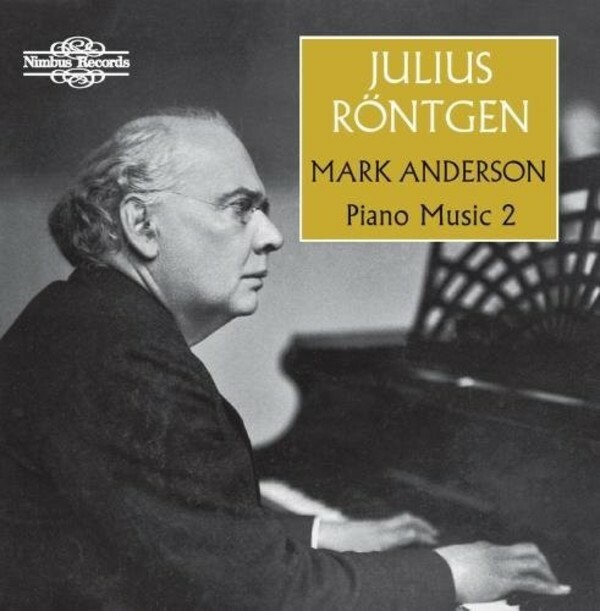 Röntgen started and ended his creative life as a piano composer.